Law school deans from across the state recently gathered in Nashville for the Tennessee Board of Law Examiners’ 2018 Deans’ Summit. The summit featured presentations and discussions on a range of topics, from law student wellness, to innovations at Tennessee law schools, to the state’s recent adoption of the Uniform Bar Exam. 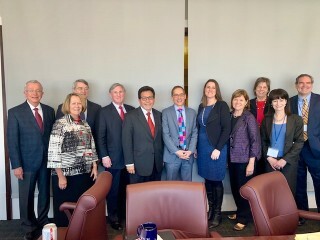 The deans from four Tennessee law schools attended the event: Alberto Gonzales from Belmont University, Chris Guthrie from Vanderbilt University, William Koch from the Nashville School of Law, and Katharine Schaffzin from the University of Memphis Cecil C. Humphreys School of Law. They joined the members of the Tennessee Board of Law Examiners, including the Board’s Supreme Court liaison, Justice Sharon G. Lee. Supreme Court Justice Cornelia Clark was also in attendance. The presentation on law school student wellness was led by two experts in the field: Ted Rice, executive director of the Tennessee Lawyer’s Assistance Program, and Julie Sandine, the chair of the Tennessee Bar Association’s Attorney Wellness Committee. Other parts of the program took the form of an open discussion between members of the Board and the deans. One of the main subjects of the day was the Tennessee Supreme Court’s April 2018 decision to adopt the Uniform Bar Exam. The Board of Law Examiners had petitioned the Court to make that change and the Court did so after a public comment period. The adoption of the UBE allows attorneys from other states to transfer their UBE scores to Tennessee and allows Tennessee attorneys to transfer their scores to other states that have adopted the UBE. Exam scores will be valid for three years. In cases where an attorney has actively practiced law for three to five years prior to submitting an application for a score transfer, then that person’s UBE score will be valid for up to five years. All new lawyers will also have to complete a six to eight hour online video course called the Tennessee Law Course before they begin practicing law, according to a Supreme Court rule revision that came in the wake of its UBE decision. So far, the Supreme Court’s decision on the UBE has proven popular. According to the Board of Law Examiners, applications for the February 2019 bar exam in Tennessee, which will be the first to utilize the UBE, are up 25 percent. The Tennessee Board of Law Examiners governs the examination, investigation and licensing of attorneys who wish to practice law in Tennessee. The five-member board is appointed by the Tennessee Supreme Court.